Many cultures believe Halloween is the one night of the year when the veil separating the physical and spiritual worlds is lifted. Since ancient times people have believed that, for a brief span of hours, the living and the dead could interact. The ancient Celts wore masks to avoid this interaction so the spirits could not drag them into Hell. And so began the tradition of finding the best costume in which to hide. We modern humans like to believe we’ve moved beyond all that superstition. We wear the costumes for fun and watch horror movies with the intention of being scared. Scary movies are for entertainment; they don’t represent real life and the evildoer always ends up dead. It’s okay, we tell ourselves, he deserves death. Those who abhor Halloween based on religious beliefs are sidestepping their own fears. It’s often about finding some way to control an irrational fear of the unknown. Yet, in reality, it’s the very direction each and every one of us is headed. We will all face that moment in time when our body becomes an empty shell left here to represent who we once were. If the death of a villain represents retribution, what does our own impending end represent? How is one death better than another? How do we rationalize the idea that we may possibly end up in the same place as the villain we detest? In other societies, death does not represent an end to existence but a transformation to another dimension or an alternate life. On The Day of the Dead, celebrated November 1, it is a time to honor those who have passed on. It is a time to gather ancestors and have a wonderful celebration with the soul of the person who passed when memories must be sufficient through the rest of the year. Death becomes not something to fear, but something to celebrate. The world is decorated with skulls and bright colors to welcome the spirits. Death is like any other unknown in life. We have two options: we can welcome the shift from one reality to a new one or we can fear it. The problem with fearing that transformation is that it’s going to happen regardless of our reaction to it. It was obviously written by a man desperate to avoid the loss of someone he deeply loved. Although his own death is debated, it has often been connected with an addiction to alcohol. I often find myself wondering if Thomas would have written a much different poem had he been able to find a way to embrace the unknowns in his life rather than fear them. Would he have found the need to drink himself to an early death? We will never know for certain, but I do know that at the end of someone’s life they rarely fear that moment of transition. Almost always they greet that moment with relief and a welcoming. What if we all looked at our own death with that knowledge? How much time and anxiety would we save while we’re here on earth if we simply dealt with the inevitability of our death first? Not everyone is going to believe in the ability of the spirit world to meet the physical world, even for one night, and maybe that’s not what’s important. The essential question should be: What if that one last breath in this world became the culmination of years of loving life rather than fearing death? From the moment we’re old enough to grasp something we are trained to value our material possessions. 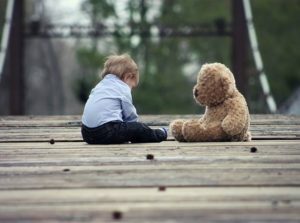 While the tattered teddy bear or worn blanket is eventually discarded for something else it has left a place in the heart and the hurt at giving it up is real. It represents a part of our being we can never recover, the moments of comfort we felt nestled against the cloth while we cried for love, food or in simple frustration. We are older now and what lies ahead is unknown. This desire to hold on to the tangible continues throughout life. We leave for college or adulthood with something from our childhood home. It might be that same worn blanket discovered boxed up in the attic; it might be a book that is linked to memories of sitting next to the fireplace reading. Whatever it is, it is a symbol for what has grounded us for so many years. For some that need to hang on becomes entangled in the driving urge for money, cars or houses. Without fully realizing what is hidden behind the want they strive to reach old age with material possessions that show everyone else how wealthy they are. They live by the adage, “he who dies with the most toys wins.” They are desperately trying to replace the emotional needs that were never met with what they see as material necessities. It becomes a desperate climb up a ladder that only ends when they reach the time of death and realize they wasted their time and energy. For others, it might be the desire to collect. Knickknacks, fabric, art or anything else that represents a piece of who they are and who they wish others to see. While it may start out as an expression of self it can easily end up taking over their life. At that point, it becomes a serious issue with hoarding. Psychologists believe we collect material objects because we’re lonely, feel the need to control our environment, or a combination of both. If you’re lacking connection with the people around you turning to “stuff” seems to fill that void. It actually distances us from others and we’re judged by what we have rather than who we are. A vast majority of people reach the end of their life with a need to purge all these possessions. When faced with the reality of death they come to realize what they accumulated in inanimate objects is no longer important. What is important are the people with whom they spent their life. It becomes a time to let go. The knickknacks, cars, and money are no longer symbols of a life well-spent; often they become reminders of time wasted. The time that should have been spent making memories with those they leave behind. Life becomes about showing, and receiving love, making amends and laughter. If there is a lesson in all this for those still living it’s that what you have isn’t that important in the end. It’s about loving, laughing, and crying with those you love. It’s never too late to get your priorities straight. I have had many opportunities to spend time with the dying, beginning with my grandfather. I remember very little about his illness other than discovering he could no longer tell his seven-year-old granddaughter stories and I was often chased away before I could wear him out. I do remember his death. The night he died he came to see me in the early morning hours to tell me I had a special purpose. It would require a good deal of wisdom and I would be much older before I realized what I needed to do. Eventually, my long winding life path led me here to help others learn to embrace death so they could embrace life. Although I’ve had many experiences that might have led me down other paths I always seem to end up helping someone find their way to a death that enables them to face life head on then embrace the new adventure. As a writer, counselor, ordained minister and life coach I am here now to help others embrace dying so they might live.